After watching this year’s Tour de France and Olympic track cycling, it’s hard not to be inspired to hop on a bike and ride. Whether the goal is to ride down a mountain faster than a car, beat friends in a race, lose weight, get fit, or have an excuse to buy a new toy — road cycling has it all. Here are the need-to-know facts every aspiring road cyclist should grasp before hitting the open road. 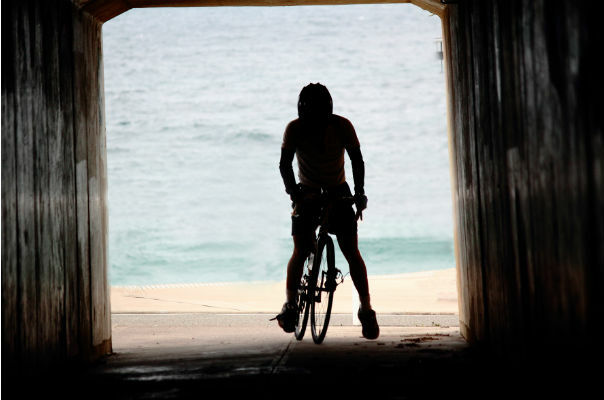 Lance Armstrong makes it look easy, but don’t be fooled — road cycling is no walk in the park. It requires concentration, balance, strength, endurance, and a little bit of craziness. It also requires a lot of energy, since it’s arguably the most calorically demanding sport. A 150 pound dude can burn around 700 calories an hour pedaling at a 14-15.9 mph pace (moderate effort). If our aspiring cyclist increased the pace to a more vigorous effort of around 16-19 mph, they could burn almost 900 calories an hour 2011 Compendium of Physical Activities: a second update of codes and MET values. Ainsworth, B.E., Haskell, W.L., Herrmann, S.D., et al. Exercise and Wellness Program, School of Nutrition and Health Promotion, Arizona State University. The Journal of Medicine and Science in Sports and Exercise, 2011 Aug;43(8):1575-81 . While other sports like running can burn just as many calories per minute, an elite marathoner might use around 2,000 calories for the entire two-hour race, but a pro cyclist can sustain this effort even longer. They can burn more than 6,000 calories in a single day of racing, and do it every day for over three weeks Nutritional practices of male and female endurance cyclists. Burke, L.M. Australian Institute of Sport. The Journal of Sports Medicine, 2001;31(7):521-32 . Cycling is also relatively easy on the joints, which makes it a great exercise for overweight people or those with mobility problems. But don’t ditch the strength training. One study found that recreational cyclists had lower bone mineral density than runners, likely due to the fact that they weren’t placing as much strain on their bones Participation in road cycling vs running is associated with lower bone mineral density in men. Rector, R.S., Rogers, R., Ruebel, M., et al. University of Missouri. The Journal of Metabolism: Clinical and Experimental, 2008 Feb;57(2):226-32 . Even pro cyclists have lower bone mineral density than average Joes Evaluation of the bone status in high-level cyclists. Guillaume, G., Chappard, D., Audran, M. French Professional Cyclism Team. The Journal of Clincial Densitometry, 2012 Jan-Mar;15(1):103-7 . Not only will strength training increase bone density, it can also improve cycling performance by boosting metabolism, building lean weight and shedding fat Resistance Training is Medicine: Effects of Strength Training on Health. Westcott, W.L. Quincy College. The Journal of Current Sports Medicine Reports, 2012 Jul;11(4):209-16 Effect of different bicycle body positions on power output in aerobically trained females. Hubenig, L.R., Game, A.B., Kennedy, M.D. University of Alberta. The Journal of Research in Sports Medicine, 2011 Oct;19(4):245-58 . Ready to start riding? Here’s a 12-step action plan to get you started. 1. Wear a helmet: This should be a no-brainer (literally, if a cyclist crashes without one). Not all states require cyclists to wear a helmet but it’s one of the easiest and most effective ways to keep the noggin safe. 2. Get the right fit: Work with a local bike shop to create a perfect fit on the bike. This will avoid back pain and injuries and improve performance over the long-term. Bike fits are highly individual, but a good rule of thumb for determining saddle height is for the user to place a bare heel on the pedal and adjust the saddle so that the knee is locked. Cyclists can adjust it from there to suit taste Cyclists Improve Pedalling Efficacy and Performance After Heavy Strength Training. Hansen, E.A., Ronnestad, B.R., Vegge, G., et al. Aalborg University. The International Journal of Sports Physiology and Performance, 2011 Dec 2 . 3. Bring a repair kit (and learn how to use it): Buy a spare tube from the local bike shop, cover it in baby powder (to make sure it slides into the bike tire in emergencies), and put it in a plastic bag. Carry a bike pump and a patch kit to avoid getting stranded. Practice fixing a flat at home before the ride to make sure it can be done in an emergency. 4. Find a place to ride: After searching for a cycling club, look for ride routes and maps on the club’s website. These rides will be safer, smoother, and easier to follow than random roads. 5. Find some cycling friends: The best way to learn road cycling is to ride with more experienced riders. There’s no substitute for real-world instruction and most cyclists are happy to teach newbies everything they know. Search the USA Cycling website to find a club. 6. Bring some ID: Accidents happen, and it’s a good idea to have some identification in case a cyclist becomes unconscious or injured. Bring an old driver’s license, scribble some information on a piece of paper, or use a fancy bracelet or anklet with contact information on it, called a Road ID. 7. Get comfortable with cars: Cyclists have to share the road and not all drivers are as courteous as they could (or should) be. Don’t get upset or flash vulgar hand gestures if a driver comes too close. Stay calm, maintain control over the bike, and wave. It’s better to make friends with drivers rather than be enemies. 8. Learn the lingo: Cycling is not just a sport - it’s a culture with its own language. The terms will come naturally after a time, but here are two basics every rider should know: “drafting,” riding behind another cyclist to limit wind resistance and save energy, and “peloton,” a group of riders drafting off one another. 9. Spin up to speed: Aim for a high cadence of around 90-100 revolutions per minute. This might not be possible at first, but make it a goal. This will make the pedal strokes smoother, which will reduce fatigue and increase speed Effects on the crank torque profile when changing pedalling cadence in level ground and uphill road cycling. Bertucci, W., Grappe, F., Girard, A., et al. Université de Franche Comté. The Journal of biomechanics, 2005 May;38(5):1003-10 Effects of saddle height, pedaling cadence, and workload on joint kinetics and kinematics during cycling. Bini, R.R., Tamborindeguy, A.C., Mota, C.B. Universidade Federal do Rio Grande do Sul. The Journal of Sports Rehabilitation, 2010 Aug;19(3):301-14 . 10. Learn to love tight clothes: It’s possible to get away with regular shorts for brief rides, but don some tight-fitting, padded bike shorts for longer ones. This keeps the body cool, cuts down on drag, and keeps the, um, “undercarriage” comfy. 11. Resist the urge to splurge: Believe it or not, it’s possible to spend more than $20,000 on a bike. Don’t do it. Most beginner bikes will be around $500 to $1000, which is still a good chunk of change. Luckily, the rewards are worth the cost, as a good bike will last several years. Start with a lower-priced model and resist the temptation to buy a super-bike… at least for now. 12. Think about joining USA Cycling: USA Cycling is the official governing body of mountain biking, BMX, track cycling, road cycling, and pretty much any other form of human powered vehicle on two wheels in the United States. For those who are interested in trying a bike race, a USA Cycling license is required. Joining USA cycling also has some nice benefits, including information on where to ride, bike shops, cycling news, tips, and clinics. Feeling faster already? Go to the local bike shop (“LBS” in cycling speak) and start testing some bikes. Ask lots of questions and be ready to make a few mistakes — that’s how road cycling is learned. Check out the list of resources below for more information. Will you try road cycling? Tell us in the comments below.